Oooh! This was just like fine candy. I so needed a break, a rest, a nice long train trip. Clickity-clack. Clickity-clack. The train runs down the track. . . . I tried hard to parcel out this story. You know . . . take a little time to enjoy and savor. I did pretty well, too, until I got to the middle of the book. Then, I couldn’t stop. It was too much fun! I had to eat up the rest of the whole story all at once. This was a romance with a dream; a dream a 15-year old girl would have when she met a boy that drove her to distraction. He was an older boy–just passing through town—decided to stay a while and woo a pretty young girl. It was that summer that Aisley Sullivan fell in love with a boy who wouldn’t tell her his name; he just said, “Call me David.” Little did she know she would be dreaming of that summer for most of her young adult life. And, what was so good about this book, what it had that captured me–is that it was all believable. It wasn’t the mushy, sappy type of romance that makes you either swoon or puke. It was more nostalgic; the kind of story that brings sweet remembrances of a time long ago when your emotions are so strong and alive and everything is brilliant like the sun. It kept reminding me of the risky things I did at that age, like having a boy/girl slumber party and everyone told their parents that they would be at their “friend’s” house for a sleep over. It was dangerous and exciting—well, exciting back then . . . but all we did was play music, kiss, and everyone kept their clothes on. We thought it was dangerous and exciting, though. Somehow Katherine Grey knew what I did when I was a young girl of 15. She knew how I felt, and how powerful a brand new love can be at that age. She’s managed to take me back there tonight and has put a smile on my face with her simple sweet story. 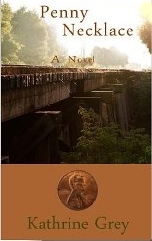 Thank you Katherine Grey and Review the Book for this complimentary copy of Penny Necklace. It was so nice to get away for a little bit. . . .
Kathrine Grey holds a Bachelor of Arts Degree in Fiction Writing from Columbia College Chicago. All of her story titles are contrived from R.E.M. lyrics (ever more avowed since their disbandment). When she is not writing, she manages a popular Italian restaurant near Lake Michigan. She is graciously allowed to live in Mishawaka with her husband and their kitten by the two adorable bunnies who rule the house. This entry was posted in BOOK REVIEWS, POSTS and tagged Chicago, Drama, Feminist, Fiction, Illinois, Independence, R.E.M., Relationships, Romance, Teen, Trains, Travel, Women, Women’s Fiction, Women’s Literature, Young Adult. Bookmark the permalink.